(Nanowerk News) Titanium and gold are usually not magnetic and cannot be magnets - unless you combine them just so. Scientists at Rice University did so and discovered what is a first of its kind: an itinerant antiferromagnetic metal -- TiAu -- made from nonmagnetic constituent elements. The research by the lab of Rice physicist Emilia Morosan has already been cited as a textbook example of how magnetism arises in metals. While the uses for this particular magnet have yet to be determined, the Rice discovery could enhance the scientific understanding of magnetism. An open-access paper about the research appears this week in Nature Communications ("An itinerant antiferromagnetic metal without magnetic constituents"). This is not the kind of magnet one would stick to a refrigerator. Magnetic order only appears in TiAu when the metal is cooled to 36 kelvins, about minus 395 degrees Fahrenheit. "Magnetization is a function of temperature," said lead author Eteri Svanidze. "The magnet's ordering temperature appears as an anomaly in the smooth curve we see in such magnetization measurements." For common magnets, that temperature is generally hundreds of degrees Fahrenheit, way hotter than any kitchen. But the energy and temperature scale in unconventional magnets, like the few that have no magnetic elements, are drastically reduced. Svanidze said the magnets will enhance studies of other important physics, like phase transitions (as in solid-to-liquid or liquid-to-gas) that take place at absolute zero, called quantum phase transitions. 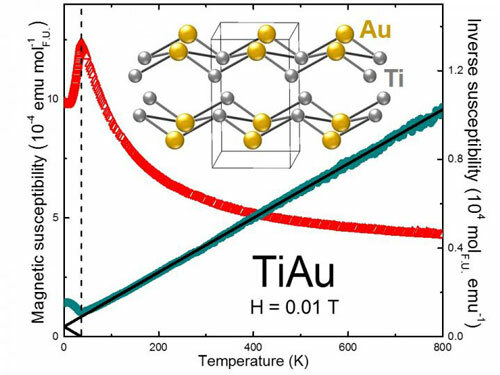 TiAu is only the third known itinerant magnetic metal made with no magnetic elements. The other two, both ferromagnets that activate their magnetic order at temperatures even colder than TiAu, were discovered half a century ago. Part of the reason for the long gap is that TiAu is challenging to make. "When we started looking, we found out why 50 years had passed without any additional discoveries," Morosan said. "Most other possible candidates were problematic in one way or another. They were hard to make, chemically unstable, toxic or required a high temperature that was not accessible in the lab." "We had to discard many candidate compounds," said Svanidze, who worked on the project for six years as a Rice graduate student. But electronic structure calculations showed a 1-to-1 mix of titanium and gold might have the properties they were looking for. "This is not a new material," Svanidze said. "What we found are its magnetic properties, and that's where the interesting physics comes in." Materials usually become magnetic when exposed to a field that brings the magnetic moments of its atoms into alignment. Think of each atom or ion as a tiny self-contained magnet that can align itself with the neighboring magnetic ions, like the needle of a compass. The magnetic moment of a material can be local (tied to a specific atom) or itinerant (not bonded to a single atom). Itinerant wanderers can extend their influence over more than one atom, facilitating communications between their "up" or "down" spin states. They also allow for handy things like electrical conductivity in metals. Atomic moments in local-moment ferromagnets - that is, common magnetic materials - align all of their spins in the same direction. In an antiferromagnet, the atomic moments align in opposite directions. Morosan said it's important to know these extremes in magnetic behavior. "Theoretically we understand local-moment magnetism quite well, and we have some understanding of the itinerant moment, but most true systems really live in between," she said. "We have to understand the extremes in order to figure out the physics of what's going on in between." "I think the most significant part is that such a phenomenon is very rare," said Jiakui Wang, another Morosan lab graduate student and co-author of the paper. "This is the first time such an antiferromagnetic material has been discovered, so it is fundamentally significant. It makes our understanding of magnetism deeper." Morosan said basic scientific discoveries often need time to spawn applications. "My hope is that we can eventually find enough of these systems to understand them better. Then we'll know what we're dealing with so we can make compounds with the exact properties we want."